View More In Robotic Lawn Mowers. 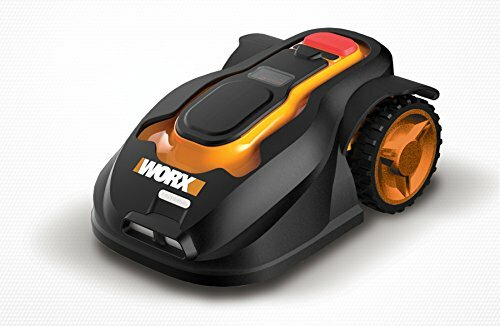 The Worx Landroid is the pre-programmable robotic mower that lets you customize daily mowing schedules. The Landroid runs 7 days a week giving your lawn a continuous manicured look by giving the grass a trim on a routine basis as opposed to traditional mowers that take off substantial amounts of grass on a less frequent basis. Among its many features, Landroid navigates narrow passages, cuts with precision on slopes angling up to 20 degrees and does it all with zero emissions. If your lawn is under 10750 square feet and you want it to look great every day, the Landroid is designed precisely for you. The Intuitive keypad makes it easy to customize a mowing schedule so your lawn is neatly mowed every day. The low noise operation allows you to mow during the day or night. This allows you to wake up to a freshly mowed lawn every morning. The Landroid runs off of a 28V rechargeable battery so there are zero emissions.